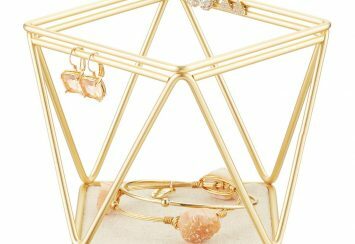 The Cutest Jewelry Boxes For All Your Bling! 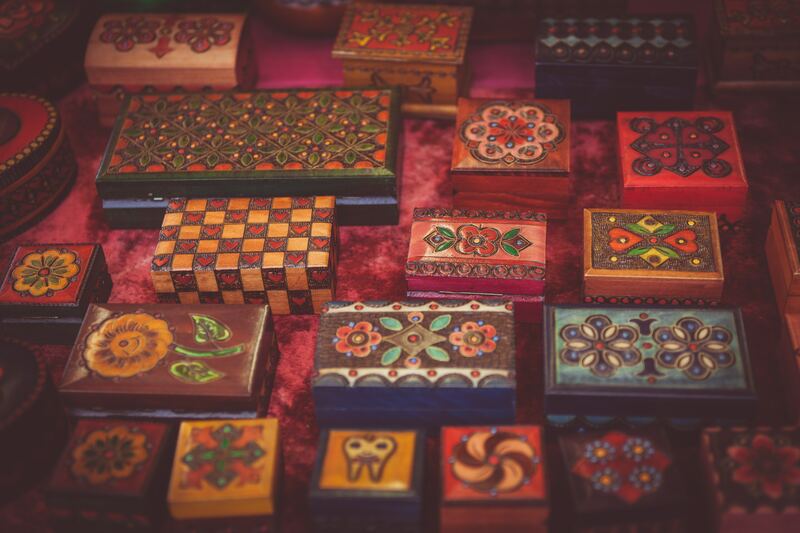 Since our childhood, we all had grown accustomed to using jewelry boxes to store our precious belongings. Sometimes it was just a toy and sometimes, it was our way to travel to another dimension where we get to be the royal princess. We would then carefully put the few rings and chains we had into different sections. 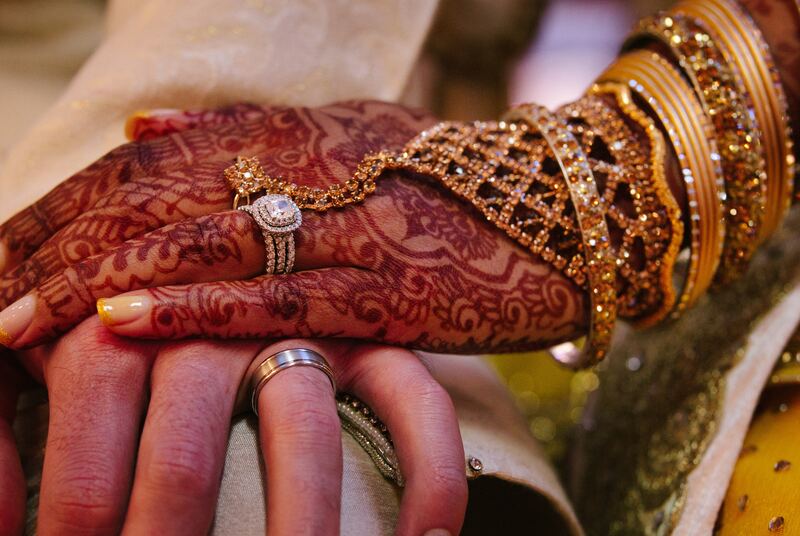 Each moment made us feel like truly rich humans with a lot to live for. Though most of that charm is gone now, we still feel the need to find a safe and comfortable home for all the gorgeous pieces we have collected throughout our lives. With that thought in mind, here we present 15 of our top picks for jewelry boxes! 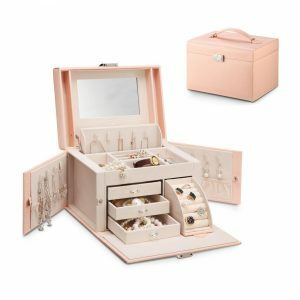 Why do we need jewelry boxes? We buy a lot of beautiful jewelry pieces of different kinds. It can be a pair of earrings, a gorgeous necklace or some stylish bracelets. To keep them organized all the time is difficult. When we need to take a number of them with us for an event located far away, we realize the significance of a jewelry box. Usually, there are several compartments or sections in such a box. 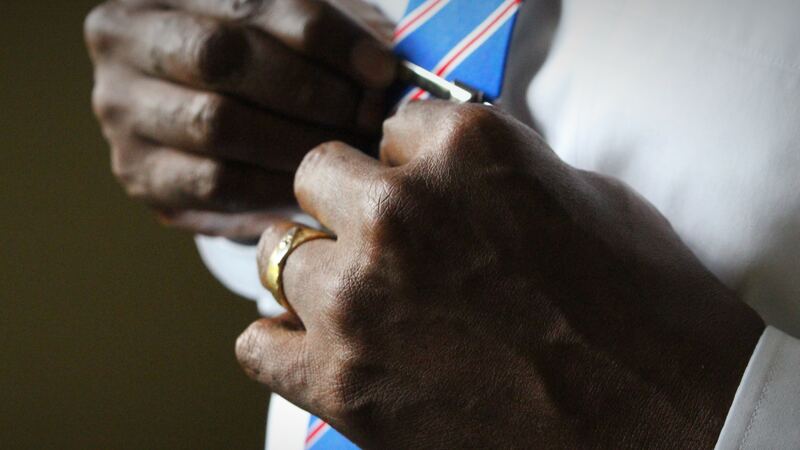 This allows us to put in a variety of accessories with us without compromising their quality. Besides, some of them also allow you to lock them up and keep it safe from all potential thieves. So for the security of those ornaments and your convenience, having a jewelry box is very necessary. Here are the 15 best picks of the day! 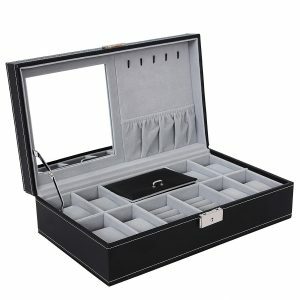 This classic jewelry box is made by Glenor Co which specializes in producing luxurious and stylish ornamental packages. In this case, it is a square PU leather box made with smooth finishing and elegant design. The gorgeous metal buckle at the front is incorporated into a magnetic snap allowing you to open and close the box with convenience. There are three colors available – black, blue and pink. The black one is the most classy while the other two allow you to have more vibrant colors on the dressing table. It is 8 and a half inches in both length and width. There are two compartments above and below each provided with 25 slots. 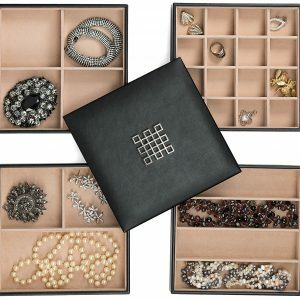 So you can put a total of 50 earrings, cufflinks, rings or chains in this box. The whole interior is made of a fabric similar to soft velvet and thus does not allow scratches to last. A large mirror on the back of the lid can let you know instantly which pair of earrings will suit you the most. It comes with a beautiful gift box and a blank card where you can write off a personalized wish for the lucky recipient. Though it costs pretty high, if you are not satisfied with the product, you can have all the money back because of the 100% satisfaction guarantee. This one is also from Glenor Co and has very similar construction. They come in three distinct colors of classy black, vibrant blue and sophisticated pink – each one with its own charm. The modern metallic snap on the front adds more to the already stylish box and is perfect for leaving a long-lasting impression on someone. A total of 28 sections of varying measurements is included in the velvet interior, divided into two compartments. The top one is a tray and can be slid off anytime with ease. 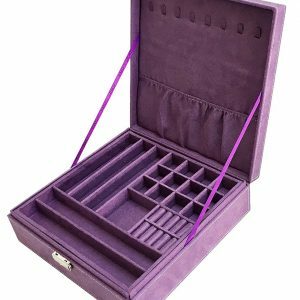 The sections allow you to store large beads necklaces, expensive watches, glamorous earrings and carefully crafted rings all in one place! They do not tend to get tangled because of the well-placed dividers. On the inside, there is a huge square mirror covering the whole lid area. 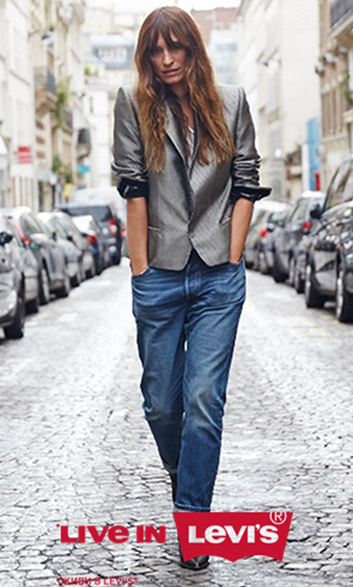 This will let you figure out the right combination of accessories for the day. Besides, if you are outside or on a trip, you can do a quick check-up of your look in the car. It comes with an elegant gift box as well as a blank gift card to let you add some heartfelt words and wishes. There is also a no-hassle money back guarantee in case it fails to satisfy your needs. This one too has a high price tag on it. 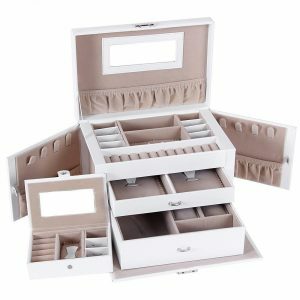 Another great option to keep your jewelry organized is this one where four trays are provided each with a unique design! 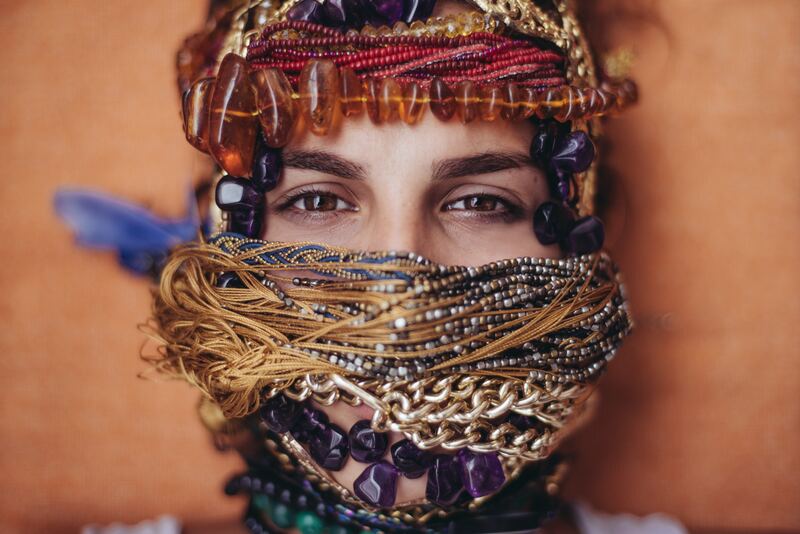 Because of such variations, you can keep necklaces, bracelets, earrings, rings, watches and almost anything of any length. It is very easy to disassemble them but to keep them stacked together as a box, you will need a straight and smooth surface. Otherwise, they might all fall down making a mess. That is why it is not an ideal option for traveling. On the top of this box, the signature symbol of Glenor Co brand is set up at the center of shining metal. Under that, there is a large mirror which is easy to pick up and hold at any angle. So you can check any part of your look quickly before leaving. A total of 27 slots are provided in its velvety interior. The exterior of 7 inches length and width is made of PU leather and has a smooth finishing. Like all other Glenor products, it also comes with a gift box and a gift card but is relatively more affordable than other choices. There is no other color option available for this one except black. Vlando is an international brand revived by Dutch designers who specialize in creating storage solutions for home and office. They have brought a breath of fresh air in our list with its wooden jewelry box which is available in four colors of cherry red, classic black, mysterious grey, and peachy pink. It is 11.1 inches in length and 5.6 inches in height. As a result, it contains enough space to allow a variety of ornaments to be kept in its two-storied flannel interior. The outside is made up of synthetic PU leather and velvet lining to give it a stylish and sophisticated look. This combination also makes it very durable. The upper compartment has four ring slots, four small slots for tiny earrings or chains, and a bigger slot in the middle with lid. This one can be used to keep longer chains or thin bracelets. On the lower compartment, there are four equally sized slots where earrings, clips, and bracelets of medium size can be stored. One of them, however, is divided into four smaller slots to make room for small rings or brooches. Due to its elegant design, it is best suitable for classy women looking for a solution to safely store their carefully selected treasures. Its affordable price makes the box an even better choice! Enchantmints and their products are all just as unique and dreamy as their brand name. Each box here is sprinkled with dreams, fairytales and an enticing music piece as the background score. As soon as you open it up, a dancing ballerina welcomes you with her twirls and the Swan Lake music! Every time you look at this box, it will remind you of those times when job or reality was none of your concern. It is meant for girls between 6 and 12 years old because this is the age group where the magic happens! This is the time when we all believe in charming princes, witches, and enchanting potions. 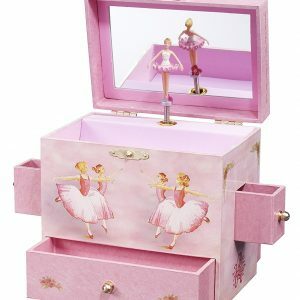 The box is adorned with baby pink color all over and features four little dancing girls in the front. 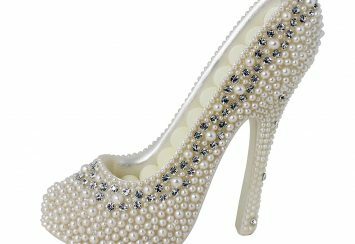 It lets the young women feel like a real princess and also teaches them to keep their ornaments organized at the same time! This box is also available in a number of other attractive designs like heart-shaped, ballet school, ballet class, ballet shoes etc. Its structure is also very unique since it features two narrow drawers coming out of both sides. But the main storage space is included on the top and bottom drawers. Inside the hinged lid, there is a mirror and all the slots together allow you to keep earrings, charms, and bracelets. Its price is also pretty affordable. Out of their wide range of products distributed internationally, this jewelry box is one of the best form Songmics! Despite being a very young brand, the quality of their products has managed to draw the attention of customers in a short time. This box comes in two classic color variations of black and white. While white adds sophistication, black will add more boldness to your dresser. The best part about this one is that it allows locks to keep your expensive belongings under safe hands. Its exterior is made of high-quality faux leather while the interiors have soft velvet in beige color. Hence, the possibility of scratches or damages to the ornaments is very low. This box is perfect for traveling since it comes with a mini travel case and has 20 compartments of varying structures. The whole thing is designed in such a way that no space stays unutilized. Even on the sides, two doors are added with pouches and hanging hooks inside to make room for bracelets or chains. Behind the lid, there is a small mirror and a pouch where you can keep thin bangles. 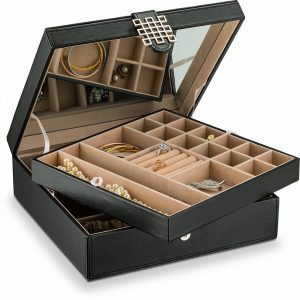 For all other drawers, you can use them to store necklaces, watches, earrings, hairpins, cufflinks, brooches and more! This easily affordable multi-functional box can be a huge help and thus, an ideal gift idea for anybody who prefers practical presents. This one from Vlando is a small jewelry box with velvet lining and premium synthetic PU leather as its main exterior material. The top is padded to make it soft and comfortable for your hands. Inside the box, there is high-quality beige flannel and an elastic pouch behind the lid to store your miniature jewelry pieces or bangles. It is available in nine trendy colors of black, blue, grey, white, khaki, pink, yellow, orange and Christmas red. You can also buy two, four or eight of them as a set for splashing more colors on your vanity. There is also a tassel designed version available in this box. The size of this box is pretty small as par its cheap cost, with four inches length and width. Due to its light weight, you can also take it with you in long trips or vacations. Instead of usual lids, this box has a zipper with silver tone pull for easy and more durable functioning. It also gives you more assurance of keeping the ornaments inside safe. There are two main compartments inside including one column dedicated to rings and another area which can be partitioned according to your choice. You can divide them into two or three regions using the given dividers. 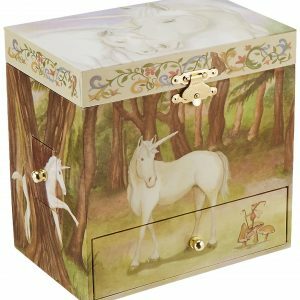 Living up to its name and fame, this jewelry box from Enchantmints is another trip down the fairyland where you can have unicorns as pets instead of cats and dogs. There is also a pegasus version available where you can have a trip with the majestic flying creature among the rainbows! For this one, the unicorn invites you to an enchanted forest and its miniature galloping version welcomes you warmly as soon as you open it up! Also, at this time, a beautiful tune plays out keeping the magical theme in mind. Behind the unicorn is a mirror covering the whole lid area. It has a golden boundary around to remind the young owner she is, in fact, a royalty. This easily affordable box is primarily meant for kids and teenagers, but we won’t judge you for using it since logically, princesses can be of any age! Every space of this container is perfectly utilized giving you lots of choices to store your tiny belongings. It is six inches in length and height with four drawers in total. Two of them are very small and come out from each side of the box. You can keep chains, small rings and stud earrings here. 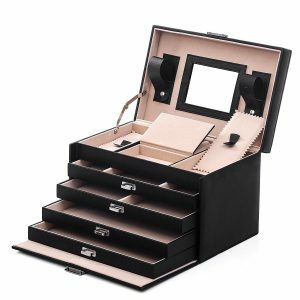 The two bottom drawers are large enough to keep necklaces, watches, bracelets and even some small cosmetics like a lipstick! The top compartment can be used to store a variety of things similar to the bottom drawer. 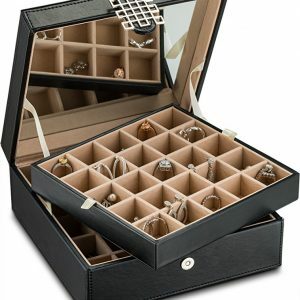 Another product of Songmics for us is this jewelry box where a variety of ornaments can be stored with confidence. This box comes in two shade combinations. One of them is the usual black one where the interior is of gray color. The other one has a more warm tone of brown and its interiors are colored in creamy beige. This one has a very useful structure inside where there are separated and dedicated compartments for a variety of accessories. Two slots are prepared only for rings with five rolls in each. Then eight slots are dedicated to watches with removable velvet cushions provided. In the middle, there is a black or brown lid which hides a bigger area to store larger ornaments like embellished eardrops or jumbo hoops. You can also put in cufflinks and brooches here. The area behind the hinged lid is divided into two equal parts. The left one features only a mirror for you to check out your current look, while the right one has a pouch and five hooks. You can hang up bracelets or necklaces here, and keep clips or pins in the pouch. From outer looks, this affordable box does not seem super stylish or luxurious, but as we all know, it is the inside that matters. It can also offer better security for the expensive pieces since its door can be shut down with a lock. Two keys are provided in case you lose one. Breaking all the convenient rules regarding colors, this jewelry box from Sodynee comes in two vibrant shades of blue and purple. It is mainly made using fiberboard of medium density and covered up with the softest lint. There are two layers in its structure and the top one can be completely taken off. There are nine equally sized slots in the lower compartment where you can keep any jewelry of a medium size. This includes bracelets, earrings, brooches, chains and more. On the upper tray, there are a number of dedicated areas specialized for multiple types of ornaments. Two of them are for rings only and are padded with six rolls. Twelve tiny areas are also present to store pieces like toe rings. Five long spaces are also provided for chains and bracelets. Behind the lid, there is an elastic pouch and eight hooks to hang up your favorite necklaces. To keep all these precious pieces safe, you can lock them all up and keep the key in a secure but convenient place. The whole box is 10.2 inches in both length and width. If it gets damaged or if it doesn’t satisfy you enough, you can ask the makers for a refund or replacement. The price is very low making it a very safe investment of your hard earned money. 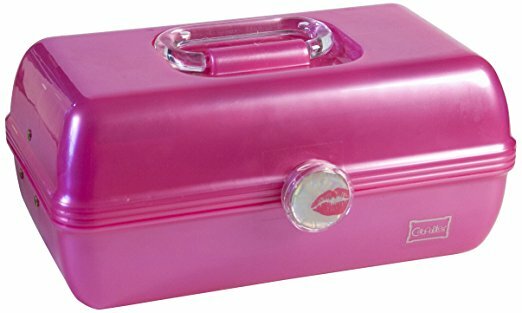 This one from Caboodles is made specifically for young girls. It offers the least amount of dedicated space but is a very good option for traveling. The whole box measures 13.38 inches in length and 8.88 inches in width. It brings the vibes of the 60s and 70s with its striking colors, polished surface, and simplistic design. These are available in three equally vibrant colors of purple, pink and pink sparkle. The material of the case is fuchsia pearl plastic and looks cheaper than other options on this list. However, its price is also extremely affordable and varies according to the chosen color. There are two layers here hinged to each other with clear handles and the lower one contains a huge amount of space. In case you are not afraid of the jewelry getting tangled on the trip, this space can be immensely useful to you. It can hold necklaces, earrings, bracelets and even makeup items like lipsticks and small brushes. On the upper connected tray, you can store smaller items due to the three divided compartments. It also has a lift-up mirror for you to see if the accessories are looking good on you. A compact box in an adorable shape and bright colors is presented by Vlando. The color palette includes sky blue, black, red and roseo. All of them have a beige colored flannel interior which adds more chicness to the whole look. The exterior is made of deluxe synthetic faux leather and has velvet lining for a more comfortable touch. The cute oval shape has three divisions inside where the left and right compartments are given equal area. You can keep your earrings, bracelets, and necklaces here. In the middle, there is two compartment where the top one is dedicated to rings and the bottom one has three narrow slots for earrings or clips. There is a mirror behind the lid for those times when you need to put up accessories in a rush. This box is a great option for travelers since it stays closed and has no possibility of slipping away the inner treasures. Though it looks extremely elegant, sophisticated and luxurious, it actually costs very little. It is, in fact, one of the most affordable boxes on our list and also weighs very little. This jewelry box from Vlando offers the highest amount of dedicated spaces compared to other similar options. It is pretty big with 10.2 inches length and 7.1 inches width. The outside is made of deluxe synthetic leather with velvet lining, while the inner contains high-quality flannel. Such material combinations made it resistant to high wear and pollution. Moreover, it comes in five colors namely champagne, white, black, red and pink. The availability of sophisticated, vibrant and bold colors at the same time allows all kinds of women to try it out. It is structured in an amazing way by the expert designers of Netherlands to make the best use of spaces from all sides. The top compartment has three medium-sized slots for bracelets and three narrower slots in the middle. You can use them for storing bracelets, rings, and chains. 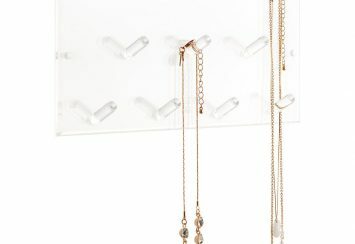 There is also an automatic pull-out compartment behind with six hooks to hang up necklaces. In the bottom part, there are three drawers and a pull-out section of ring rolls. Out of the three drawers, two are large and the other one has four smaller slots in it. On both sides, there are two doors with hooks and small pouches. These can be used to store pinks and hang up bracelets, charms or earrings. Take a look at the middle behind the lid for a quick check-up on the look you have tried today. 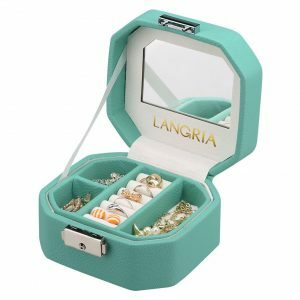 Langria brings you the jewelry box with a unique shape of an octagon. Adding to its unusual and refreshing shape, there are also a number of soothing colors these boxes can be found in, like pale green, pink, white and grey. This is the cheapest box on our list. But there is no way to guess that from its stylish appearance and sturdy structure. It is made of MDF board frame, faux leather, and soft velvet lining. As a result, it feels really soft on your hands and is easy to use on a daily basis. When you lift up the lid, you will see a mirror looking back at you to make sure the whole look is coming together well. There are two compartments inside where the upper one is removable. On it, you will find a column of ring rolls and three slots on both sides. You can keep ear studs and chains in these slots. Below this top tray, there is a large space where you can keep the necklaces, bracelets and other bigger pieces. It is safe to take this with you while traveling since it weighs very little. Also, its size is pretty small compared to other boxes and there are enough partitions to keep your things organized and easily accessible. You can also lock it to keep these treasures safe and secure. This one from the young brand of Songmics has a commendable number of compartments in its hefty box of 4.5 pounds. The exterior is made of medium density fiberboard, high-quality velvet, and faux leather. It is approximately 11 inches in length and 7 inches in width. Almost 8 inches height allows it to offer you more space than its contemporaries. There are four removable drawers in the bottom part and the last two of them come with even more partitioned slots! They descend in size from top to bottom. So you can use them combinedly to keep necklaces, bracelets and even small makeup brushes and eyeshadow cases. On the top, there are two side slots and the middle portion is covered with a ring roll and a shielded slot. These slots can be used to store cufflinks, ear studs, chains and more! The mirror behind the lid is accompanied by belts on each side where you can hang up your chosen earrings. You can keep the lid upright due to the attached metal hinge. To keep all these valuable accessories secure, you can lock it up and keep both of the keys in safe places. The price range for this is pretty affordable. 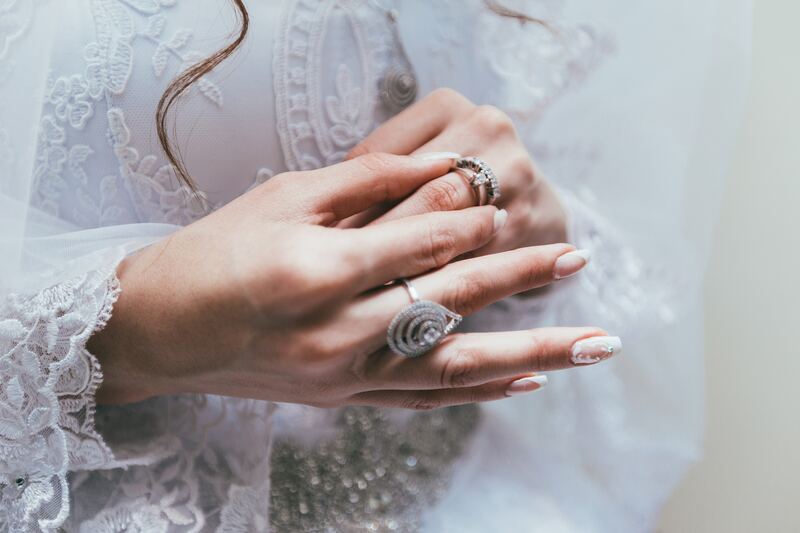 How to store the jewelry? Out of all your treasured collections, the ones you need to wear on a daily basis should be kept in the top compartment for quick and easy access. Another option would be to buy a different box or case small in size to store them all in one place. Then you can also take it with you wherever you need to go and put on some pieces before taking a photo or attending a sudden event! Also, remember to hang them up on the provided hooks or put them in the pouches of the box since they are the easiest to take out. Of course, these will have to be limited to earrings, necklaces, and bracelets. It is very easy to damage gold jewelry. They can get scratch marks from other harder metals or stones. So it is ideal to keep them separated from other metals and wrapped up in soft clothes. In this respect, the jewelry boxes with slots of velvet lines or similarly soft interior are ideal. 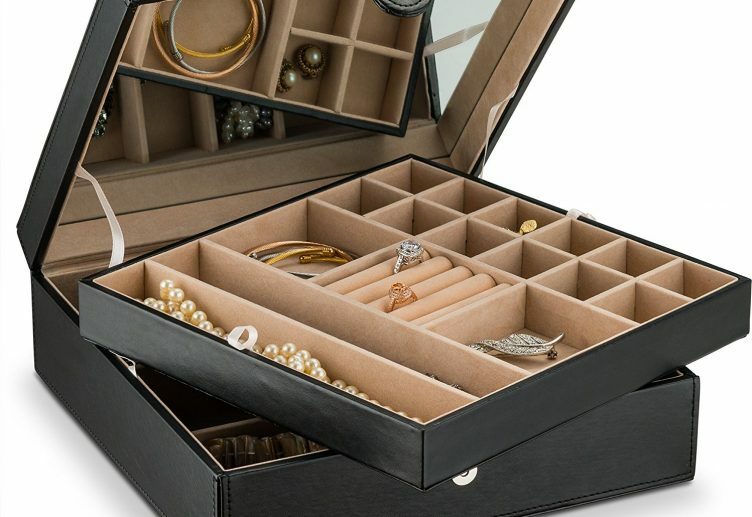 If you don’t have a jewelry box yet, let them be stored in the box given by the seller. Diamond itself is an extremely hard material and thus it can harm the surrounding pieces of different metals like gold, silver, and platinum. It can also put scratches on other gemstones like emeralds and rubies. So keep diamond accessories separate from others and wrap them in soft cloth pouches. Silver ones are the most vulnerable to getting tarnished. It can get faded by water or long daily exposure to air. 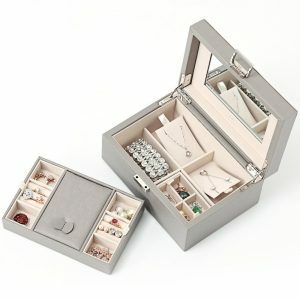 There are jewelry boxes which are aimed at keeping silver jewelry safe. They come with a tarnish-proof fabric lining to serve that purpose. Besides, make sure these silver pieces are not getting in touch with rubber because its sulfur can also make them tarnish. With a little bit of care, all these pieces can last for years and the jewelry boxes can definitely help with that. We hope you get to store your precious jewels in at least one of these beautiful boxes and enjoy carrying them with you no matter where you go!